The early childhood curriculum at Acorn Hill is not only play-based, it is focused on child-initiated play. While many of us instinctively appreciate the importance of play to young children’s healthy development, the critical role of imaginative free play for learning in young children has now been scientifically established. Research shows that children who engage in complex forms of socio-dramatic play have greater language skills, better social skills, more empathy, more imagination, and more of the subtle capacity to know what others mean. They are less aggressive and show more self-control and higher levels of thinking. The classrooms at Acorn Hill provide an environment that encourages children to initiate play and learn by freely exploring the world around them, which in turn nurtures self-education and self-regulation skills. Our teachers support this process by tuning into each individual child’s play and helping him or her build on it by providing materials, new ideas and support to overcome obstacles. In this way, the teacher is always supporting the growth of each child with the methods best suited to the individual. The daily activities in a Waldorf kindergarten and nursery all work to strengthen the primary senses and encourage physical, social, emotional and intellectual development through free play, rhythmic physical games, art such as painting and woodworking, acting out stories , and the participation in the chores and household activities such as setting table, kneading bread dough and cooking. 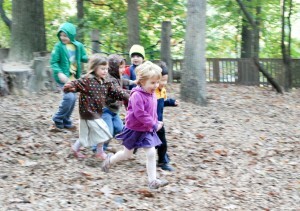 The Waldorf early childhood curriculum at Acorn Hill builds the skills required as a foundation for academic learning. Sequencing, sensory integration, eye-hand coordination tracking, language development, active listening skills, creative storytelling and the love of learning are all fostered in the pre-school and kindergarten. Dr. David Whitebread’s University of Cambridge research project on academics and play in early childhood. Also see this report by Dr. David Whitebread, University of Cambridge.